Geneva, Phillips press release, 16.02.2018 : Phillips in Association with Bacs & Russo is proud to announce the sale of a historically important Omega wristwatch, once belonging to Elvis Presley. 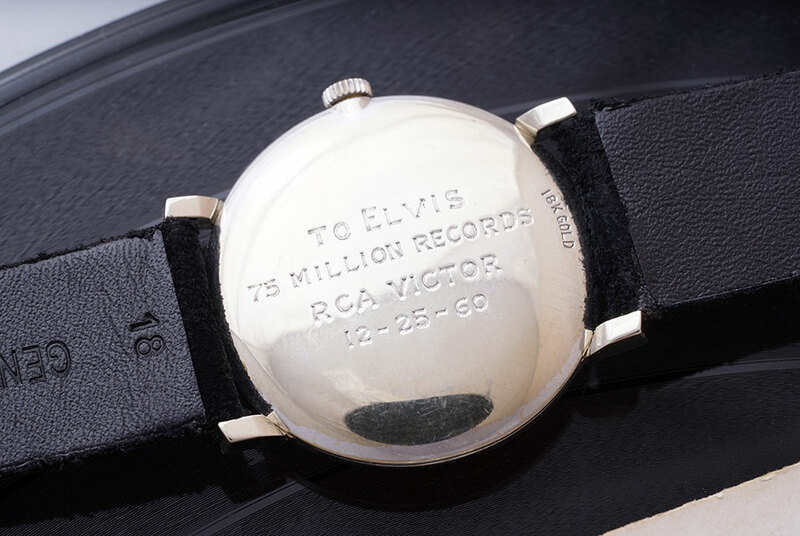 A highlight of Geneva Watch Auction: SEVEN taking place on 12 and 13 May, this exceptional timepiece, which was owned and worn by the rock and roll icon, was gifted to him in 1961 by RCA Records to commemorate his remarkable achievement of having sold 75 million records. Elvis Presley signed with RCA Records in 1955, launching him into a career as a music phenomenon who electrified millions of attendees at his live performances and sold an unprecedented number of records. Over the course of his lifetime, Elvis had an active role in creating the modern American musical landscape and the development of a unique youth culture. His importance to the inception of rock and roll, and contemporary music as a whole, cannot be overstated. His image has transcended the categories of the music he played and the movies he starred in to become a cornerstone of modern pop culture, with his estate at Graceland remaining a pilgrimage site for fans decades later. 1960 was a pivotal moment in Elvis’ career, most notably Christmas of that year. Having steadily released pre-recorded content in anticipation of Elvis’ hiatus between 1958 and 1960 when he was drafted into the U.S. Army, RCA Records was eager for him to return to the studio. By Christmas, Elvis had two well-attended movies in theaters, Flaming Star and G.I. Blues, as well as both the number one single in the United States and the United Kingdom with Are You Lonesome Tonightand It’s Now Or Never, respectively. Research suggests that 25 December marked the actual date Elvis reached 75 million records, which, after two years of not having the chance to record, was an incredible feat. The watch was given to the current owner’s uncle after he had expressed his admiration for Elvis’s watch. Spotting the diamond studded Hamilton the admirer was wearing, Elvis proposed a trade, and they quickly exchanged timepieces. Elvis is well known to have given away watches he purchased or was given, and a small number of these have appeared at auction in the past. No other Elvis Presley-owned watch has been previously offered on the market that marked such a significant achievement in his career as the present lot. The incredible provenance of this historic timepiece is furthermore confirmed by photos of Presley wearing the watch at the charity concert, as well as certificates of authenticity from the Elvis Presley Museum. The elegant dress watch is cased in 18k white gold, housing a manually-wound Omega calibre 510 stamped with the ‘OXG’ import code for the United States – in accordance with the “Tiffany & Co.” retailer signature beneath “Omega” at 12 o’clock. The bezel is set with forty-four round brilliant diamonds, accenting its vibrant silver dial. The watch will be sold with certificates of authenticity from the Elvis Presley Museum and a book titled “Elvis,” by Dave Marsh, that includes images of Elvis Presley wearing this watch. Phillips is honored to offer this superb vintage Omega with one of the most fascinating provenances to ever appear on the market.